The best toddies and other hot cocktails in Seattle may not be where you expect. The most-talked-about French restaurant now also makes some of the best hot drinks in town. This forecast calls for something steamy, boozy and fortifying — a sipper to warm your belly even while the frost nips at your ears. This cold spell calls for a detour to L’Oursin. 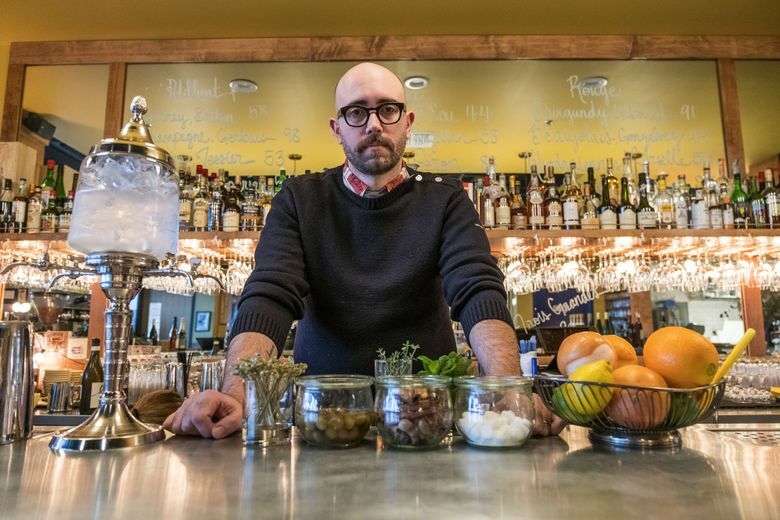 Located on a quiet stretch near Seattle University, this French bar/restaurant, which makes excellent venison terrine and cassoulet, devotes the left corner of its drink menu just for “boissons chaudes,” warm cocktails. On Monday, even with the snow dump, every stool at L’Oursin was occupied as bartender Zac Overman held court. He makes some of the best cocktails in town. He gives toddies and other wintry tipples a French tweak. The tequila-and-cinnamon flavors usually found in a spiked Mexican hot chocolate get reconfigured here as a toddy (Black Lodge) with a French sweet wine Dubonnet and reposado tequila — a lighter, less bloated libation with bright, floral pink peppercorn, cinnamon, orange and rosemary. Overman’s cognac version of the Irish Coffee doesn’t have that stale or burnt coffee taste that mars so many local takes. With fresh cream and a punch of espresso, it tastes richer and more decadent than the old whiskey standby. But come for the Vin Beurre, an acidic Loire Valley white enriched with calvados butter, a pleasantly tart, nutty drink that goes down easy — too easy if you’re not careful. This mulled wine — infused with toasted almonds, golden raisins, honey, ginger and thyme — is the best hot cocktail I’ve tasted this winter.